Sweet for meat? Mad for splatter? Craving carnage? 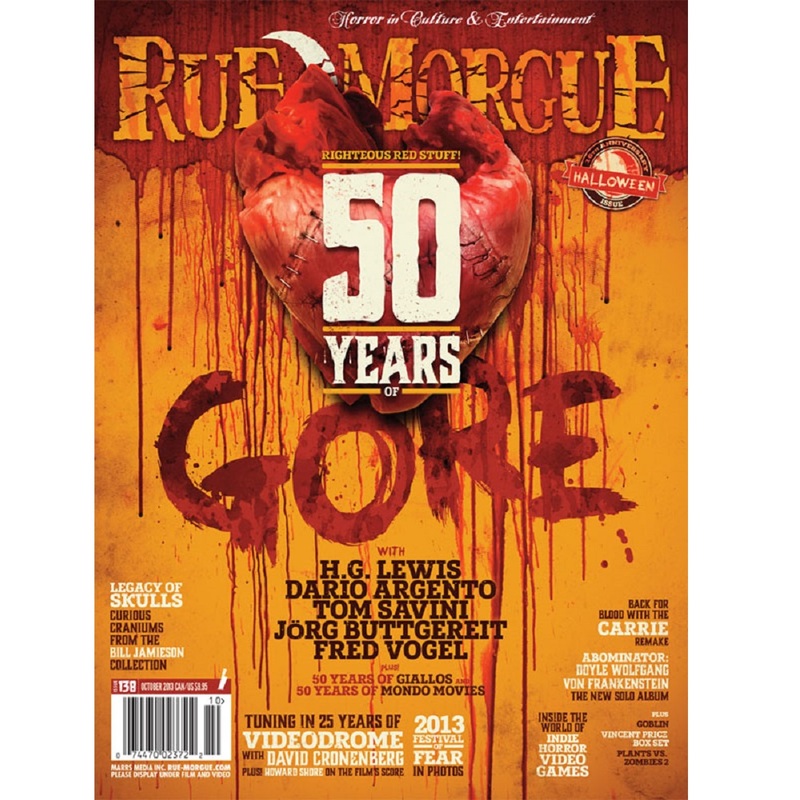 We enlist gore gods Herschell Gordon Lewis, Dario Argento, Tom Savini, Jorg Buttgereit and Fred Vogel to help us delve into a half-century of cinematic slaughter. PLUS: With giallo expert Alan Jones, we investigate the history of the spectacularly violent movement on its golden anniversary, and five decades after Mondo Cane ushered in the shockumentary, we shield our faces for a peek at the real video nasties. 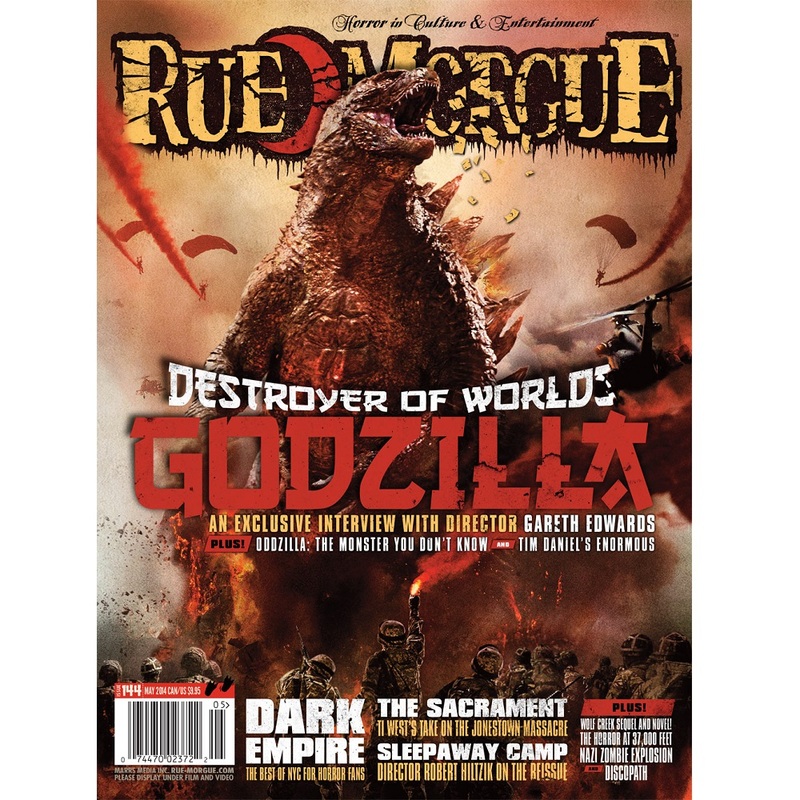 Rue Morgue peers into William Jamieson’s modern-day cabinet of curiosities. David Cronenberg reflects on the freaky and amazingly prescient Videodrome, three decades after the techno-body horror film first hit screens. PLUS: Howard Shore explains what it’s like to get inside the filmmaker’s mind while scoring his work. Feast your eyes on photos from our 10th annual horror convention. Make your own monsters – the D.I.Y. movement comes to genre video games. PLUS: We pick five of the most compelling indie horror titles outside of the ever-popular first-person shooter. Carrie remake director Kimberly Peirce and star Chloe Grace Moretz find fresh blood in Stephen King’s classic tale of one girl’s high school hell. Former Misfits guitarist Doyle Wolfgang von Frankenstein trades horror punk anthems for macabre metal on Abominator. Bram Stoker estate endorses new theatrical production of Dracula; Stuart Gordon taps Kickstarter to fund film version of Poe play; Monster cereals fans resurrect Frute Brute and Yummy Mummy. Weird stats and morbid facts. Sick Top Six: High Flying Heads. Blood Pool Chopping Board; Bloody Cleaver Clutch; Bloody Brain Soap; Little Timmy in Lighted Specimen Jar. CineMacabre features reviews of Riddick, Fright Night 2: New Blood, Haunter, The Happy House, Under the Bed, Detention of the Dead, My Amityville Horror, Halloween Home Haunts, Among Friends, Gallowwalkers, Twixt, Virus X, Zombie Exs, and The Ghastly Love of Johnny X. Reissues features The Vincent Price Collection, plus reviews of The Devil’s Backbone (2001), Swamp Thing (1982), Body Double (1984), Corruption (1968), and X-Ray (1982)/Schizoid (1980) Double Feature. In The Vault: The Uninvited. Dug Up: Yeti: Giant of the 20th Century. 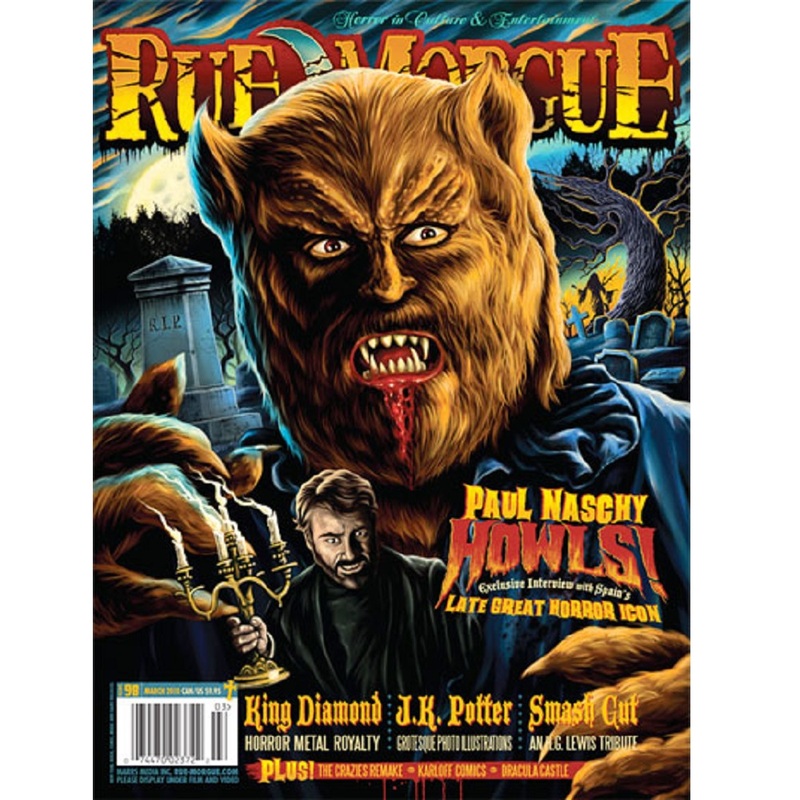 Features Manborg, plus reviews of Damsels: Giant Killer one shot, Grimm Fairy Tales: No Tomorrow #1 of 5, Saga #13, Superman: Phantom Zone, and Bela Lugosi’s Tales From the Grave #4. Spotlight: Bleeding Skull! : A 1980s Trash-Horror Odyssey. Library of the Damned celebrates physical books with Madeleine Roux’s Asylum. Plus, reviews of New Critical Essays on H.P. Lovecraft, David Nickle’s The ‘Geisters, The Women of Hammer Horror, Gary McMahon’s The Bones of You, Kathleen Scheiner’s The Collectors, and more! Menu: The Incredible Melting Man and Street Trash. Featuring our five fave soundtracks by the Italian gods of gore scores Goblin, with commentary by Massimo Morante. 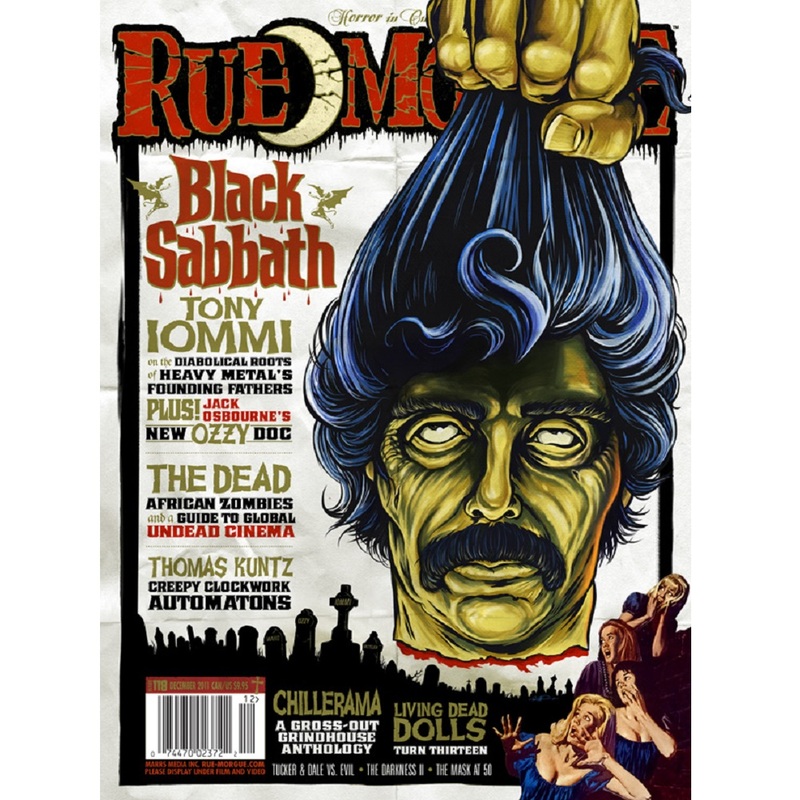 Listen to My Nightmare asks Exhumed’s Matt Harvey to pick his top five splatter movies. Plus reviews of The Fog OST, David Lynch, Lonesome Wyatt and the Holy Spooks, Espectrostatic, Twiztid, Toxic Zombie, Dead Federation, Author & Punisher, and Facebreaker. Features reviews of Outlast, Plants vs. Zombies 2: It’s About Time, and Dying: Sinner Escape. Caravaggio’s The Beheading of John the Baptist. 20 New Subscribers will win a copy of John Carpenter’s Halloween 35th Anniversary Edition, courtesy of Anchor Bay Entertainment.